U.S. President Donald Trump waves as he walks on South Lawn of the White House upon his return to Washington, from France, Nov. 11, 2018. Trump, in a string of Twitter comments, said "much was accomplished" in his meetings with other world leaders. But he said it was "never easy bringing up the fact that the U.S. must be treated fairly, which it hasn't, on both Military and Trade." The U.S. leader contended, "We pay for LARGE portions of other countries military protection, hundreds of billions of dollars, for the great privilege of losing hundreds of billions of dollars with these same countries on trade." Trump added, "I told them that this situation cannot continue - It is, and always has been, ridiculously unfair to the United States. Massive amounts of money spent on protecting other countries, and we get nothing but Trade Deficits and Losses. It is time that these very rich countries either pay the United States for its great military protection, or protect themselves... and Trade must be made FREE and FAIR!" Trump has declared himself a "nationalist," with an America First outlook on international relations. But in Paris on Sunday at the commemoration of the end of World War I, French President Emmanuel Macron, with Trump listening nearby, deplored rising nationalism throughout the world, declaring it a "betrayal of patriotism." 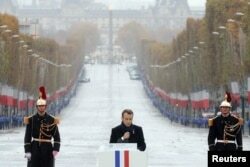 French President Emmanuel Macron delivers a speech during a commemoration ceremony for Armistice Day, 100 years after the end of the First World War, at the Arc de Triomphe, in Paris, Nov. 11, 2018. Trump throughout his nearly two-year presidency has often complained that numerous European allies have yet to meet NATO's 2024 goal of spending 2 percent of the size of their national economies on defense, chiefly funding for military weapons and armed forces. 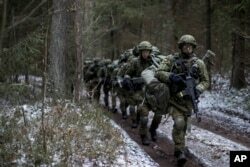 FILE - Lithuanian troops practice during a NATO military exercise, 'Iron Sword,' at the Rukla military base some 130 km. (80 miles) west of the capital Vilnius, Lithuania, on Nov. 28, 2016. Eight of the 29 members of the West's main defense alliance, forged at the end of World War II, are expected to meet the target this year — the U.S., Britain, Greece, Estonia, Romania, Poland, Lithuania and Latvia. Trump has expressed his ire that Europe has a trade surplus with the U.S. — $101 billion in 2017 — meaning that the EU ships more goods and services worth that much to the U.S. than it imports from America.